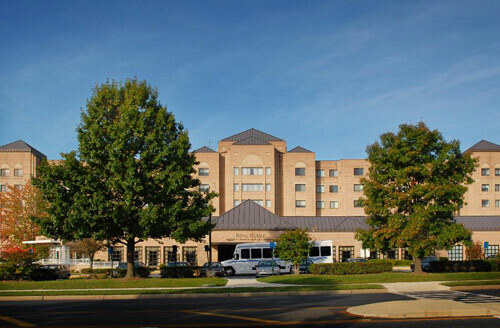 Rockville, Maryland has a small Jewish community with regular minyanim, kosher restaurants, a kosher supermarket, and the hotel is on the subway (they call it a “metro”) line. 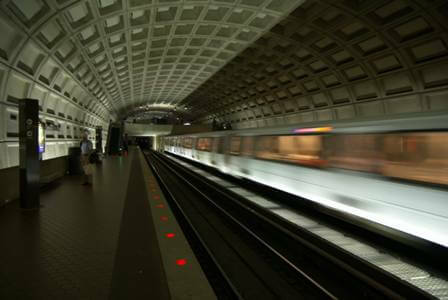 Driving,Rockville is about 45 minutes to Washington, D.C and the same to Baltimore. Stay turned for an article dedicated to Washington, D.C. (which is just as well, since the federal government is partially shutdown at the time of this writing, anyway), but we’re here to tell you about Rockville right now. Also, it’s worth noting that the much larger Jewish community of Silver Spring, MD is nearby. There are a greater number of kosher restaurants and greater number of minyanim, but no hotel on the subway. 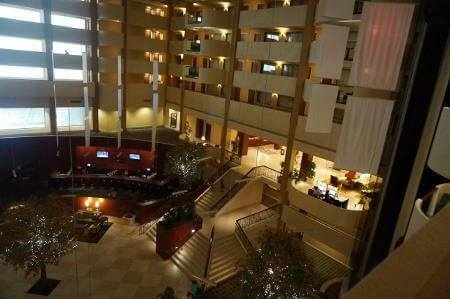 We stayed at the Hilton because it’s an upscale hotel, but given it’s distance from the major cities, the price is comparable with economy hotels. Being on the subway line, the distance, we thought, wouldn’t matter. 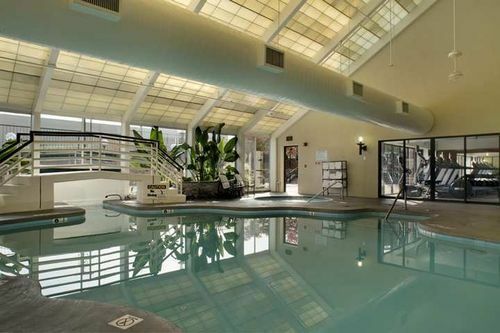 We were wrong about that, but the hotel is beautiful and at roughly $141/night and also with adjoining rooms available and a combination indoor/outdoor pool, the hotel was great. If there’s one constant that kids love on any vacation, it’s the pool. Parking is available for $15/night. Across a non-busy 1-lane/direction street from the hotel, is the metro stop. A minyan is about three blocks away, along with kosher food. This is discussed below. Relying the metro turned out to be a mistake – at least with little kids and strollers. The subway is expensive, slow, and not stroller friendly at all. Changing trains means going up and down a series of elevators in very poorly lit subway tunnels. As an added bonus, on the one day we rode it to everything, a subway had broken down once in the morning, and again in the afternoon. Each person needs their own subway card (called “Smart Trip” but it’s written on the card in such a way that my kids preferred to read it, “Smart Rip[off]”) for $5, and then you pay something like $5/ride each way per person. As with the museums in the capital, it just seems like . . . something run by the national government. True, it’s the best government in the world today, but communist governments have much better mass transportation. The capital of the country is all about driving – parking was relatively easy to find in Washington, D.C. and you can pay with credit card using your phone. You don’t even have to go back to put in more money … even with my non-smartphone phone, I received text messages and could add another 2 hours for $3. With kids, where we spent maybe 2-4 hours at any location, this was a much better deal than the subway. The Ezras Israel synagogue holds it’s weekday morning minyanim at “Ring House”, an old age home with some Torah observant residents. This is all of a few blocks from the Hilton hotel. It’s a beautiful building with a beautiful room used for the minyan. It also starts promptly on time – 8:15am or 8:00am. Minchah is held at 4:00pm, or you can find a z’man minyan at the Young Israel of Potomoc, but it’s a bit of a drive away. For many more minyanim, that would be in Silver Spring. Thus, if we did it again, knowing what we do about the train, we probably would have stayed in Silver Spring. While we checked out that each of these restaurants has proper kashrus supervision, please check before eating there as the information may change. Cafe Shawreen – 188 Rollins Ave, Rockville, MD – This restaurant is a mere few blocks from the Rockville Hilton and metro stop. It has your typical Israel-style hummus, shwarma, chicken, et al that you expect to find in a stereotypical kosher restaurant. It was decent. Sienna’s Restaurant – 11417 Woodglen Dr, Rockville, MD – They deliver in the area. Definite plus on a day when you’re kids (or you) are not up to sitting in a restaurant. This was Italian-style food (but not kosher-style … it really is kosher) and was pretty good. Subway @ the JCC in Rockville – It just closed! You missed the opportunity to try the lowest class subs that the traif world has to offer, only in kosher form. I say this, but my kids loved it. 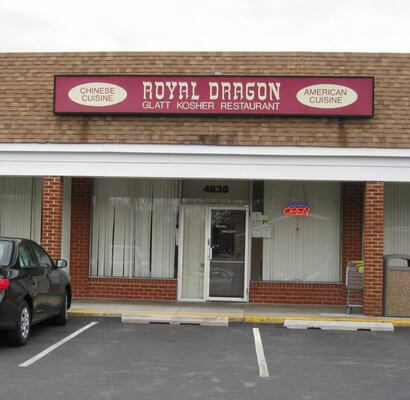 Royal Dragon Kosher Restaurant – 4832 Boiling Brook Pkwy, Rockville, MD – This is a “proper” Chinese restaurant. The author being a ba’al tesuvah, I am used to Chinese restaurants where you sit down at a nice table with a table cloth, they serve you tea in small round porcelain cups, and fried noodle things as an appetizer. They actually do that here – it’s a real sit down restaurant with menu, as opposed to the “McDonalds-style” fast food layout of far too many kosher Chinese restaurants. Oh, and the food was pretty good here, too. Motti’s Supermarket and Restaurant – -4860 Boiling Brook Pkwy – This is in the same strip mall as the Royal Kosher Restaurant. We didn’t eat here, so we can’t comment on the food, but the supermarket is a fairly nice, having everything you’d find at a kosher supermarket anywhere else. They also have a lot of private label goods which we found to be very good. Avail yourself of the kosher food, minyanim, and lower rate hotel … and drive to Washington, D.C. or Baltimore, M.D., of course!